How do you choose an audio interface? 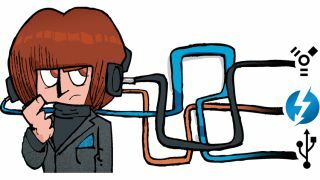 Which audio interfacing path should you go down? In theory, choosing an audio interface should be easy. Decide how much you want to spend, how many and what kind of inputs/ outputs you need and you'd think that the list of contenders would be pretty short. In reality, though, picking a box to take care of your audio I/O requirements can become a frustrating process, not due to a shortage of models, but quite the opposite: there's a dizzying array of products on the market, using a range of connection protocols - USB 2.0 and FireWire being the most ubiquitous, and USB 3.0 and Apple's Thunderbolt at last beginning to make their presence felt. The situation isn't helped by the fact that most audio interfaces look pretty similar: how do you know which is best when you can barely tell them apart? First things first, then: what should be your major considerations when looking to buy your first interface or upgrade from an existing model? Joe Lawton, Product Manger at audio hardware specialist Focusrite, has a simple answer: "It must sound great. This means that the signal flow from analogue input to digital conversion to analogue output - all components - must not compromise the sound that is being recorded. Aside from that, you need an interface that meets your needs and is easy to use, reliable and has frequent [software/firmware] updates." PreSonus is another highly respected manufacturer, and they take a similar view. "Users should be concerned first with sound quality and the right I/O for their needs. That's the bottom line. Then decide whether the rest of the feature set is right, including onboard monitor mixing, effects, and so on. "It's also important to consider the software bundle, especially the bundled DAW. If your DAW and interface are well integrated, you're likely to have a smoother workflow and less down time troubleshooting things that ought to just work." "If you're a beginner, the quality of any bundled production software may influence your decision." PreSonus raises the software issue, no doubt, because it ships a version of its Studio One DAW with all of its interfaces. It's a good application, certainly, and if you're a beginner, the quality of any bundled production software may indeed influence your decision. Those who already have an allegiance to a DAW are likely to be less concerned with what else comes in the box, though, unless there's a particularly good selection of synths and/or effects to be had. Where both Focusrite and PreSonus have it bang on, though, is in their comments about sound quality and I/O. Identifying your input and output requirements shouldn't be too difficult, but, as we've already suggested, determining sound quality is difficult. You can't download a demo of an interface and, given that every manufacturer is going to tell you their product sounds great, you're going to have to take the word of reviews (both from users and the likes of MusicRadar) on that all-important issue. What of the method by which your interface connects to your computer, though? Over the past few years, USB 2.0 and FireWire have been the dominant standards, but with USB 3.0 and Thunderbolt now starting to gain traction, are these familiar favourites soon to be out of date? "Most people will find that the current interface line-up will remain relevant through the next couple of generations of computers," say PreSonus. "We're currently in a transitional period that's similar in some ways to the transition from serial ports and PCI to USB and FireWire a decade ago. Most such transitions are stressful for manufacturers and end users alike. "However, with Apple's introduction of the FireWire/Thunderbolt adapter, FireWire will be supported on the Mac platform for at least the foreseeable future. On the Windows platform, we expect FireWire cards will continue to be available as long as there is sufficient customer demand, which should easily get us through this transition period." It has been suggested that FireWire is fast becoming a moribund format as far as audio interfaces are concerned, so owners of devices that rely on it should take comfort in the fact that it might not be heading towards obsolescence quite as quickly as some have predicted. What's more, we've started to see interfaces that support both USB and FireWire - does Focusrite's Joe Lawton think that these could become the norm? "Owners of FireWire devices should take comfort in the fact that they might not be heading towards obsolescence quite as quickly as some have predicted." "The technology is available, and manufacturers are free to implement this. But the development overheads and time required may keep most interfaces to one connector type." In theory, USB 2.0 interfaces should work fine with most computers well into the future; USB 3.0 is designed to be backwards compatible, so plugging an older generation product into a next-gen port shouldn't cause a problem. However various interface manufacturers have reported performance issues with USB 2.0 devices used this way, so are these problems likely to be long-term? Fortunately not, according to PreSonus. "These are just growing pains that will be easily resolved with new drivers, updated firmware and more testing. In addition, USB 3.0 is still new, so it will take a while to discover chipset incompatibilities." Good, solid drivers, of course, are essential to any well-regarded interface, so it's always worth checking how regularly these are updated and other people's experiences of a product's overall stability before making an investment. Based on what we've heard, it's pretty safe to say that any current generation interface you buy should work with most computer hardware for the foreseeable future, but if you're thinking of upgrading your device, what (if any) are the advantages of hanging on in there for a Thunderbolt or USB 3.0 model? Joe Lawton believes that, for audio applications at least, one of these standards has much more to offer than the other. "USB 3.0 does not offer great advances in 'synchronous' data transfer (ie, the transfer type used for audio streaming). Thunderbolt, however, is like connecting straight to the computer's motherboard and so can (in theory) provide near-zero- latency audio in and out of your computer. "Thunderbolt is vastly superior to USB 3.0 in this respect but, due to the fact that it is still relatively new technology, it can be quite expensive to implement." PreSonus is similarly positive about Thunderbolt, but also see potential in its rival: "As with FireWire and USB today, there is room for both buses in the audio world. Higher speed potentially means lower latency, which is always a big plus for audio, even if you're only recording one channel at a time. "Thunderbolt has extremely exciting potential for audio interfaces, offering low latency, high stream count, networkability and more. We expect it to become a leading choice for professional interfaces but not necessarily the only good choice. "USB 3.0 offers very good transfer rates, so it may enable faster-I/O interfaces and, if past trends hold, will eventually be very widely supported. In that sense, the situation is not radically different from FireWire vs USB. We expect both Thunderbolt and USB 3.0 to be implemented in future audio interfaces." Technological changes should lead to better performance, then, but rest assured that any of the current crop of audio devices are more than capable of helping you to make great music. High-quality sound, the right I/O and reliability are what you're looking for, so maybe choosing the right interface isn't that difficult after all. This article originally appeared in issue 184 of Computer Music magazine.